Fireball is a contest this week. The review will be posted after the contest deadline closes. Holy cow, ACPT is this weekend! I’m looking forward to seeing many of you there! I think Will Shortz is trying to give everyone a boost of confidence going into the ACPT, because this week’s puzzles have been unusually easy for the day of the week. I thought Laura’s Wednesday puzzle was Tuesdayish, and now this puzzle by Ross Trudeau is barely Wednesday-hard, let alone Thursday-hard. 17a, VALLEY GIRL [One with a lot of likes?]. I, like, liked this answer! 35a, MAJORITY OWNER [One with a lot of shares?]. 49a, FENCE MENDER [One with a lot of posts?]. 57a, MOTHER DUCK [One with a lot of followers?]. It makes sense that birds would be good at Twitter. I thought this theme was very cute! The only reason I can think of for placing this on a Thursday are the wide open NE and SW corners, which make solving the non-theme fill more challenging. JOFFREY of Game of Thrones and Julian ASSANGE are slightly challenging names, and potentially the J of JAMA/JOFFREY could be too tricky for earlier in the week, but otherwise this was fairly smooth sailing. Some really nice fill in this one, including both of the aforementioned entries, MADE LOVE, REVS UP, KEPT MAN (which unfortunately duped AREA MAN a bit), and HIGH CS, clued beautifully as [Hard-to-hit pitches]! I think I didn’t like AMEN AMEN. It’s not something I often hear twice in a row, like for example HEAR HEAR or NOW NOW. Otherwise, I thought the cluing and fill was all really nice! A very solid puzzle overall — just more of a Wednesday to me than a Thursday. This has happened quite a bit lately, with many Thursday puzzles falling short of their usual difficulty. Am I the only one who thinks Thursdays have gotten (on average) easier, or do you all agree? That’s all I have this week. Hope to see many of you this weekend; otherwise, see you next week! We have a vertical theme today as revealed by 32d: MEASURES UP [Meets expectations, and a hint to words hidden in the starred answers]. Hidden in the theme answers and going upwards in the grid are units of length. 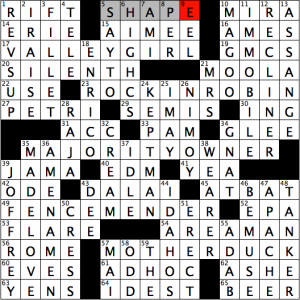 Note also the second revealer at 58d: UNIT [Each of this puzzle’s hidden words, e.g.]. 3d [*Overdid it] WENT TOO FAR. Foot. 35d [*Deadpan comic duo of radio and TV] BOB AND RAY. Yard. 7d [*Ear thermometer reading] CORE TEMPERATURE. Meter. 10d [*Test constraint] TIME LIMIT. Mile. A good set and a nice theme. But I have never ever heard of BOB AND RAY. No doubt I will be chided about that, but we all have gaps in our knowledge base, and they are in mine. Sparkly long fill in DREAM TEAM, ART DEALER, IGNORAMUS, “PARDON ME,” and POLITICO. With all that and the vertical theme entries, trying to guess what was thematic was, at first, difficult. Thankfully it didn’t take too long to find the *-d entries and the revealer. IT’S A STEAL feels a bit roll-your-owny. WHAT A STEAL rings truer to my ear. I’m not so keen on some of the stuffier entries like DONDI [Orphan boy of old comics] (again, not in my wheelhouse), SSTS (a personal dislike of mine), OENO (I don’t know how this is pronounced but I’m going to stick with “Oh no!”), MOA [Extinct ostrichlike bird] (I actually don’t mind this entry, but it added to the feel of stuffiness), and, going way back, ALDEN [Priscilla Mullins’s married name]. Apparently, she came over on the Mayflower and was the unrequited love of Capt. Miles Standish, as recounted in the Longfellow poem, The Courtship of Miles Standish. Whew! You know who else is named ALDEN? The actor portraying Han Solo in the upcoming Star Wars film. Look for him in future clues (just his first name; his last name, Ehrenreich, isn’t so crossword-friendly). 16a [Wahoo, for one]. ELM. Did not know this. Do you think the person who named it was super excited to have discovered a new species? 22a [Class for coasters]. EASY A. My first thought was roller coasters and how they could be classified, but that thought didn’t last long. 66a [Film in which LeVar Burton played Martin Luther King Jr.] ALI. Did not know this. Is it just me or does LeVar Burton never seem to age? 55d [Award for scoring, e.g.] OSCAR. Favorite clue in the grid, maybe because I sniffed it out pretty quickly. A good theme, and very nice long fill, but some of the gluey short fill weighed it down a bit. 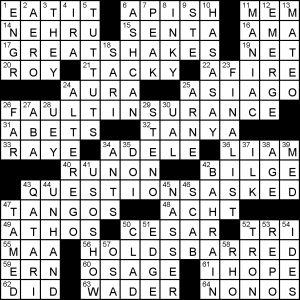 BEQ notes in the clue for 24D that “YOU first” would be a better name for this puzzle, and that unlocks what’s going on here. 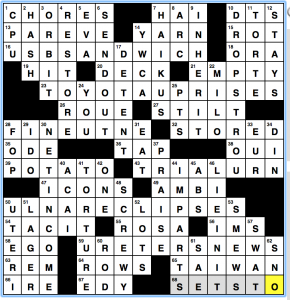 Each of these answers has had its U moved to the beginning to form a new phrase from one that’s more familiar – SUB SANDWICH, TOYOTA PRIUSES, FINE TUNE, TRIAL RUN, LUNAR ECLIPSE, and REUTERS NEWS. The reveal is NONOS, and this tells us to drop NO from the beginnings of phrases that don’t work without them, creating wackiness. We have (NO)GREATSHAKES, (NO)FAULTINSURANCE (never heard of that, and it was where I struggled the most, as I parsed it as NO FAULT IN…), (NO)QUESTIONSASKED and (NO)HOLDSBARRED. There was also a lot more difficult names and tough vocabulary than typical: APISH; SENTA Berger (no relation to Gerhard, as far as I can tell)l a mysterious actress TANYA; ARNE clued solely with a work, “Arthur” were the toughest. This entry was posted in Daily Puzzles and tagged Brendan Emmett Quigley, Marlea Ellis, Ned White, Robert Ellis, Ross Trudeau. Bookmark the permalink. That ACC/CREAM/FENCEMENDER crossing cost me a lot of time. FENCEMENDER is not a term I’ve encountered, the CREAM clue was nonspecific ([Smash], with BREAK fitting three of the crossings? ), and a sports league clue without a school or city name to provide a little more info on the team? Oof! The NE of the NYT was a rough spot for me. Didn’t know MAGOO’s dog, or MIRA or ASSANGE. The clue for AMES was on the vague side. It didn’t help that I had SUVS for GMCS for a long time. For “cheddar”, I went for the verb but I couldn’t fit anything related to making cheese in there. I’m not familiar with it as a money term. ACC was a gimme for me (go ‘HOOS!) but I can see where that clue was also a little vague. ROCKIN’ ROBIN was a delight! And I really liked the theme. It was a good Thursday for me. Good luck to all of you who are headed to the ACPT! I’d agree that NYT Thursdays have gotten easier– I’ve really noticed it since Andy mentioned wanting a hard one before ACPT about a month ago. Hoping to meet some folks at my first time in Stamford this weekend! I can’t go this year, but you will definitely meet some folks there! Don’t be afraid to walk up to groups and say hi. It’s a great crowd. That had to have been, for me, one of the easiest Thursday NYTs ever. I just blasted through it. I agree that Thursdays are easier. 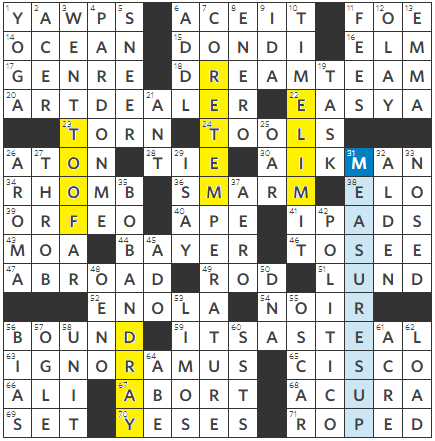 That along with the lowering (IMO) of the quality of the Sunday puzzle makes me suspect that the constructors who are strongest at wordplay and visual gimmicks haven’t been submitting their best work to the NYT, probably because of the low pay rate and the stronger competition from other newspapers and indie sites. I found the puzzle easy enough but the theme was more perplexing (I am not a user of social media). I got ROCKINROBIN and MOTHERDUCK first and thought it was going to be about birds. I didn’t know about EEL sauce either. I thought, yuck, sauce made out of eels, but then looked up a recipe online. Re BEQ: Painful, groan-worthy yet utterly delightful puns/anagrams. Didn’t understand TOYOTA UPRISES at first though – closest I could figure was Toyota Surprise, which Google tells me is a car dealership in Surprise, Arizona. On closer look, it’s not really an anagram, either. Finally saw PRIUSES. Good luck to all in the ACPT – no snow delays – leave early! The closest I ever came to this was when my father-in-law entered in the 1980’s. It was held at NYU, and we were living in the city at the time so we went and watched. Have fun all! Haven’t heard of BOB AND RAY??? Chide! CHIIIDE!!! And Bob Elliott is the father of comedian/actor Chris Elliott and grandfather to actress/comedian Abby Elliott (sp)! Their “Slow Talkers” is another classic.